Ventricular Septal Defect (VSD) is the most common congenital heart defect (CHD) (1). VSD is defined as a condition where there is a hole in the septum separating the left and right ventricles. It can occur as an isolated lesion or alongside other CHDs. VSD occurs in approximately 50% of all children with a CHD and in 20% as an isolated lesion (3). The prevalence of an isolated VSD is, on average, 4.2 per 1000 births (4). Studies show that the prevalence of VSD has increased significantly in recent decades, shown to be primarily due to improved diagnosis. VSDs can be categorised in different ways, but the most applicable ones are by their size and their location in the interventricular septum. Peri-membranous defects which occur in the upper, membranous portion of the ventricular septum, near the valves, are the most common VSDs, accounting for 70% of VSDs. Muscular defects, where the opening is in the lower, muscular section of the septum, account for 20%, with other rarer and more complex forms accounting for the other 10% of cases (5). Most patients with VSD experience symptoms primarily because of the increased flow of blood through the pulmonary circulation. Since the pressure in the left ventricle is greater than in the right ventricle, the majority VSDs will be shunting left-to-right. Very small VSD, also called restrictive VSD: The flow of blood through the VSD is minimal, so there is no significant increase in pulmonary blood flow. These patients tend to be asymptomatic. Moderate sized VSD: The flow of blood through the VSD is great enough to cause a significant increase in blood flow through the pulmonary circulation. 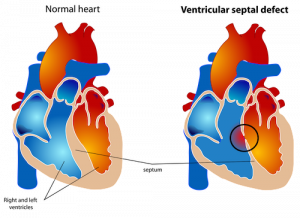 As the shunt is happening in systole, the extra volume of blood is pumped directly to the pulmonary circulation, so there is no initial effect on the right ventricle.The left side of the heart though, is receiving a greater volume of blood, which can cause dilatation of the left atrium and ventricle.These patients are at risk of developing congestive heart failure and arrhythmias. Patients can progressively develop pulmonary hypertension and the wall of the right ventricle can hypertrophy as it pumps against higher pulmonary pressures. Large VSDs: A significant amount of blood is passing from the left to the right ventricle, and so these patients develop early heart failure and severe pulmonary hypertension.Symptoms of cardiac failure are evident after the first weeks of life, when the initially high pulmonary artery pressures drop, allowing more blood to shunt through the defect and into the lungs and thus creating pulmonary plethora. Eisenmenger’s Syndrome is a condition where the pressure in the right ventricle exceeds that of the left ventricle and is caused by a significant gradual increase in the pulmonary vascular resistance. It results in a shunt reversal, with deoxygenated blood flowing from the right ventricle into the left ventricle and entering the systemic circulation. This causes decreased systemic oxygen saturation and these patients become cyanotic. Maternal Diabetes Mellitus = If uncontrolled during pregnancy, this can increase the risk of the baby developing VSD and other congenital heart diseases. Maternal Rubella infection during pregnancy= Most people in the UK are protected against this through the MMR vaccine. Alcohol (Foetal alcohol syndrome) = Cardiac abnormalities occur in 15-40% of affected infants (6). Uncontrolled maternal phenylketonuria (PKU) during pregnancy. A family history of VSD is associated with increased risk of VSD. Other congenital conditions have been shown to be related to the development of VSD. Down’s Syndrome (trisomy 21) = 40-50% of patients with Down Syndrome have cardiac abnormalities. Approximately one-third of these patients have VSD (6). Several medications are suspected teratogens, though evidence is often weak. Typically, patients will have mild or no symptoms. Most commonly these infants are brought to medical attention because a systolic murmur is detected during a routine examination. Babies may have excessive sweating, become easily fatigued, and have tachypnoea (rapid breathing). These may all be especially notable when feeding, though can be apparent at rest in more severe cases. Symptoms are usually obvious by the age of 2-3 months, as the pulmonary vascular resistance decreases causing an increase in left-to-right shunting. Babies can demonstrate similar symptoms to congestive heart failure. The baby can present with shortness of breath, problems feeding, developmental issues regarding weight and height, and may have frequent chest infections. In general, the larger the VSD, the sooner the symptoms are noted. However, with large VSDs – especially if diagnosis and treatment are delayed – Eisenmenger’s Syndrome may develop which can lead to cyanosis. Patients can demonstrate an intolerance to exercise, dizziness, chest pain, ankle swelling and a bluish complexion with clubbing of the fingers and toes. In severe cases, patients may cough up blood (haemoptysis). Undernourished: A symptom of VSD is fatigue during feeding which can cause the child to be undernourished. Sweat on forehead: A sign of increased sympathetic activity as a compensatory mechanism for decreased cardiac output. Increased work of breathing attributed to pulmonary congestion. Colour: With large VSDs, patients may become cyanotic, developing a bluish complexion. A blue tinge around the lips can be misleading so it is important to check the tongue, nail beds and conjunctiva. 40-50% of Down’s Syndrome sufferers have a congenital heart disease, approximately one-third of which have a VSD (6). Other system malformations like forearm and hand deformities (Eg. Holt Oram Syndrome) can increase the likelihood of a CHD being present. Clubbing of the fingernails and toenails can be a sign of long standing arterial desaturation that may be too mild to cause a bluish complexion. Note that other causes of clubbing include lung disease, liver cirrhosis, subacute bacterial endocarditis as well as physiological familial clubbing. Tachypnoea is often the earliest sign of left sided heart failure. It is important to palpate the precordium and to check the peripheral pulses. Thrills: A thrill of maximal intensity in the lower left sternal border would be expected. Systolic murmurs occur between the S1 and S2 heart sounds. Quality: A uniform, high pitched sound, often described as a blowing sound. Holosystolic (Pansystolic) murmur: Starts at S1 and extends all the way to S2. This is the most likely type of murmur to be heard with VSD. Early systolic murmur: Starts at S1 and ends in the middle or early systole. It usually occurs when there is lower than normal pressure difference between the two sides of the defect. Scenarios where this type of murmur may be heard include in a neonate with a large VSD and in children or adults with a very small VSD or a large VSD accompanied by pulmonary hypertension. An apical mid diastolic murmur may be heard with VSD. Description: It starts with an abnormally loud S3. Though often referred to as an apical rumble, it is said to sound more like a hum than a rumble. Mitral regurgitation: Since a similar holosystolic murmur is heard in the same region as with VSD, an echocardiogram is required to differentiate between the two. Tricuspid regurgitation: A characteristic finding in tricuspid regurgitation is an increase in the murmur intensity with inspiration (Carvalho’s sign). Patent ductus arteriosus: Associated with a continuous systolic and diastolic murmur at the base of the heart. Tetralogy of Fallot: Symptoms tend to be a lot more severe than with most VSDs. Septic screen should be carried out to rule out non-cardiac causes of collapse or deterioration in all children. Kidney function should be checked before initiating medical treatment with diuretics or Angiotensin-Converting Enzyme (ACE) inhibitors. Chest X-Ray: Can be normal with small VSDs. 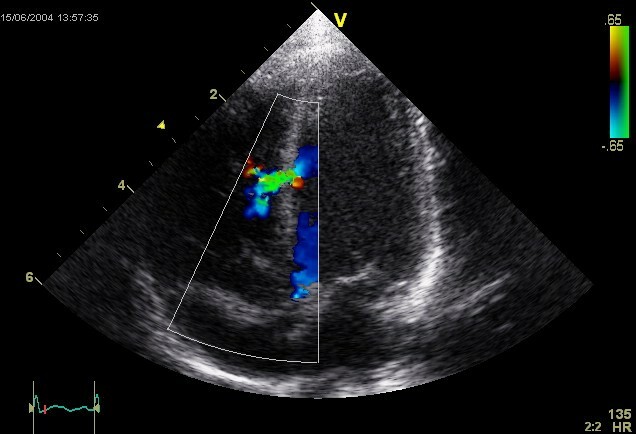 Larger VSDs may show cardiomegaly and can also show features of pulmonary oedema and pleural effusion, or even pulmonary hypertension in untreated patients. Echocardiography: The gold standard for confirmation of diagnosis. Size, location and severity as well as relation to nearby valves can be determined using this investigation. Cardiac CT angiography with ECG-gating: Allows direct visualisation of the defect. The ECG-gating is a method of acquiring data only during a specified portion of the cardiac cycle, typically during diastole when the heart is not moving.In more complex cases, a 3D model can be printed to help plan the management. MRI: Can delineate cardiac function in addition to anatomy of the lesions. This can be useful pre- and post-operatively. Cardiac catheterisation: Used in order to diagnose and treat CHDs, determine the relative pressures and pulmonary vascular resistance, the significance of the shunt and help plan future treatments. The type of management required depends on the size of the VSD. A small, asymptomatic VSD does not require surgical or medical therapy, though it is advised that these patients maintain good oral hygiene to decrease the risk of infective endocarditis. Larger VSDs require medical therapy, and surgical intervention may be indicated. These therapies and medications are used to relieve the symptoms and also buy time for the child to grow, but won’t help close the defect. Increased caloric density of feedings: Ensures adequate weight gain. Babies with CHF may be unable to consume adequate calories for appropriate weight gain in which case oral feeds must be supplemented with nasogastric tube feedings. Diuretics: Furosemide decreases the amount of fluid in the pulmonary and systemic circulation, relieving pulmonary congestion. To minimise potassium loss, Spironolactone can be added. Angiotensin-Converting Enzyme (ACE) inhibitors: These are second stage medical treatment and reduce the left to right shunt by reducing mainly the systemic arterial pressures (afterload reduction) and allowing more blood to flow through the aortic valve and less through the VSD. Note that ACE inhibitors can increase serum potassium levels, in which case Spironolactone should be discontinued. Digoxin: Used to treat congestive heart failure. It increases heart muscle strength, helps to maintain a normal heart rhythm, and removes excess water from the body. This may be indicated if diuresis and afterload reduction do not adequately relieve symptoms. Note, the data regarding efficacy of this drug in this situation is controversial so most UK centres do not use this treatment. There is usually no need for exercise restriction. Though many babies born with a small VSD won’t need surgery to close the hole, those with medium or large VSDs which are causing significant symptoms, or smaller VSDs that could possibly cause complications in later life, may need surgery to close the defect. In adults, the guidelines recommend that surgical closure of a VSD is indicated when there is a Qp/Qs (pulmonary-to-systemic blood flow ratio) of 2.0 or more (8). Surgical repair: This is open heart surgery. It is performed under cardiopulmonary bypass via median sternotomy. A patch material or stitches are used to close the hole. Catheter procedure: This procedure is less common than open heart surgery, as most defects are not suitable for transcatheter closure.A catheter is inserted into the femoral artery through the groin and is guided into the heart, under general anaesthesia. A specially sized mesh device is deployed to close the hole. Hybrid approach: The surgeon creates a small access through the left ventricle for the interventional cardiologist to deploy the closing device. Pulmonary artery banding: With the advances in the surgical procedures for early definitive treatment, this procedure is rarely performed, unless additional lesions make complete repair difficult. A band is wrapped around the pulmonary artery and tightened to decrease its diameter and decrease pulmonary blood flow in order to minimise the damage to the pulmonary vessels. Full surgical repair is usually performed in a later stage. Repaired or not, there is an increased risk of infections of the heart walls and valves (endocarditis). To help prevent this it is important to maintain good dental hygiene and also avoid non-medical procedures, such as piercings and tattoos. The possibility of endocarditis should always be investigated, especially if there is fever without focus. Prophylactic antibiotics for dental procedures are no longer routinely recommended (9). Regular cardiac follow-up is usually needed life-long, with the follow-up intervals being more spaced apart as patients get older and remain asymptomatic. Activity should not be restricted unless complications have resulted from surgery. It should be noted that a significant number of patients (about 50% (10)) have an initial residual VSD after surgery, though most of these are minimal and close spontaneously over time. However, haemodynamically important residual VSDs will need re-operation, which occurs in approximately 2.1% of patients (10). The prognosis for patients with an isolated VSD is excellent. 75% of small VSDs and especially the ones located in the muscular part of the interventricular septum, close spontaneously by the age of 10 years (11) and adults with closed VSD are expected to have a normal lifespan (12). When surgical closure is required, if the surgery is done early before any serious heart or lung problems develop and no complications arise, then the outlook is positive. The prognosis is much worse for patients who develop pulmonary hypertension and Eisenmenger’s Syndrome. These patients have progressive exercise intolerance and a worsening right ventricular function that can reduce the life expectancy to 20-50 years (13). However, the risk of developing Eisenmenger’s Syndrome is considered minimal if large VSDs are surgically closed in the first 2 years of life. From 1979 to 2005, all age death rates declined by 60% for VSD (3), and with advances in imaging and management, we can expect this decrease to continue. Which direction of blood flow occurs at a VSD generally? What percentage of Down's syndrome patients have cardiac abnormalities? Furosemide can be used in VSD to relieve pulmonary congestion. Which add-on drug can be used to minimise potassium loss? Which is not a complication of VSD? What percentage of VSD's are perimembranous? Where can the systolic murmur of a VSD best be auscultated? Which radiological investigation is the gold standard for confirming a diagnosis of VSD? What long term advice should a VSD patient be given whether the defect has been repaired or not? What percentage of small VSDs close spontaneously by the age of 10?